President Trump doubled down on his offer of a path to citizenship for California’s estimated 500,000 eligible “Dreamers” Tuesday night in his first State of the Union speech. Many Democrats don’t think the proposal goes far enough, and some right-wing Republicans would prefer to deport all the Dreamers. 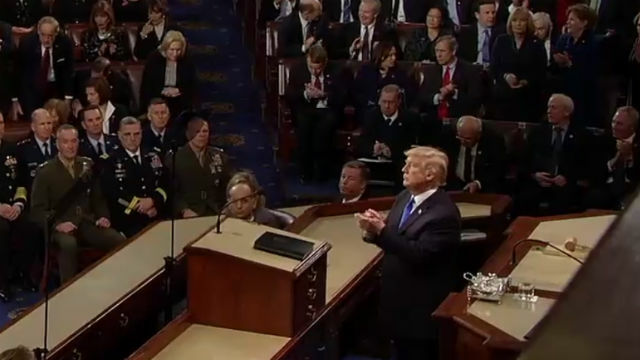 During much of the speech, Trump extolled when he considers the success of his first year in office: tax cuts, a rising stock market, the end of the health insurance mandate — the “core of Obamacare” — eliminating regulations and speeding up drug approvals. California political leaders remained skeptical of Trump’s plan to protect the Dreamers. Trump singled out one young Californian in his speech: Preston Sharp, a 12-year-old from Redding, who started a movement that has now placed 40,000 flags at veterans’ graves.